I teach music workshops at an afterschool program where kids build their own sample libraries from scratch. 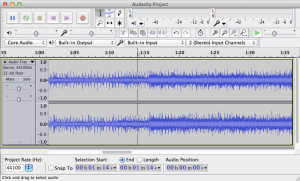 They find the default audio editor (Audacity) really frustrating, and I’m with them! So I decided to build an audio editor that does all the stuff that kids like to do (like reverse sounds, change the speed, and add reverb). I wanted an easy way to make good sounds, and learn about sound in the process.Even though it was designed for an audience who has never worked with digital sound before, the Web Audio Editor can be of use to anyone who wants effects or just a quick edit. I wanted to do this in the browser, rather than as a standalone application, after researching music education software’s transition to the web through my Technology for Music Education course (at Steinhardt). I also drew inspiration from Pixlr, the online photo editor that I choose over Photoshop for quick little edits. Web audio is still in its early stages, so the pieces necessary to build this weren’t available until very recently. But HTML5, the WebAudio API, and Canvas open up a lot of potential for audio playback and visualizations. My primary inspiration was seeing kids struggle to use Audacity. I wanted to see if I could build something simpler that functions in the browser. I developed the idea in a course at Steinhardt called ‘Technological Trends in Music Education: Designing Technologies and Experiences for Making, Learning and Engagement.’ I made it a project in CommLab Web (just to get the PHP / SoX running) and ICM (to visualize the sound data and build a user interface). The Web Audio Editor was designed for kids in my after-school workshop, so 2nd-8th graders who have short attention spans and haven’t necessarily worked with digital audio before. But I think it’s of use to anybody who needs to make a quick audio edit, or add some fun effects. 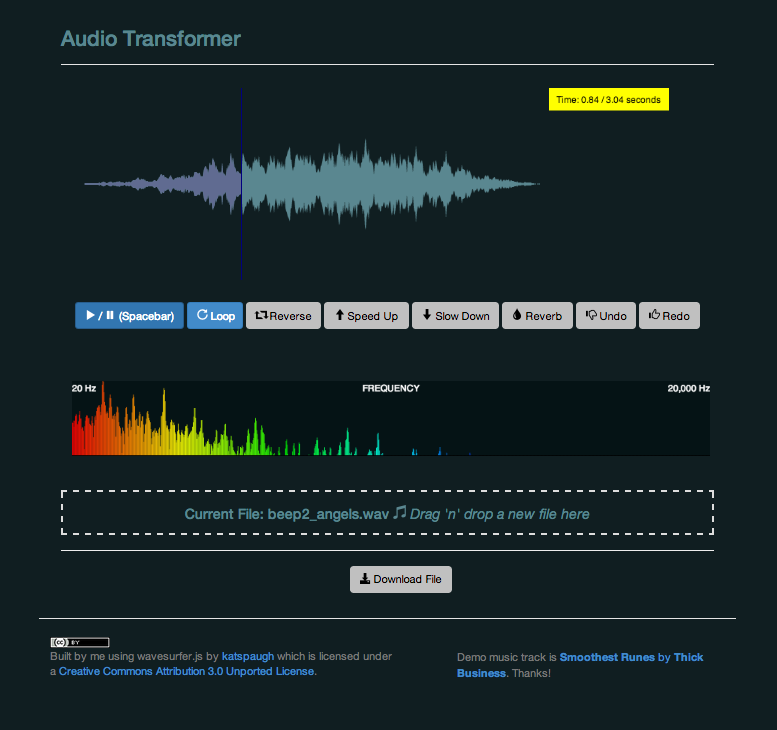 Built with SoX, and Waveform.JS a library by Katspaugh. Other libraries include Bootstrap and jquery. The frequency spectrum visualization draws from Boris Smus’ Web Audio API ebook (O’Reilly 2013). Many thanks to Shawn Van Every, Daniel Shiffman, Alex Ruthmann, Sam Brenner, Sam Lavigne, Luisa Pereira, Ryan Viglizzo, Danne Woo, Beam Center and everyone else who has helped me figure out how to do this! Here’s my Audio Transformer so far. Source code is on github. 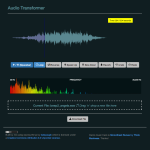 My final project, “Audio Transformer,” will be a simple audio editor that functions in the browser. I’m designing for kids age 7 and up who have never worked with audio. The idea came from teaching afterschool music workshops, and seeing how frustrated kids get by the defacto freeware program Audacity. With so many features, Audacity can be overwhelming even for adults—here’s a screenshot. I want to make this work in the browser because I’ve also been researching this topic for my class Technological Trends in Music Education: Designing Technologies and Experiences for Music Making, Learning and Engagement. So much of the technology we’ve looked at in that course is happening in the browser. Some technology, like Scratch, incorporates audio editing features. But I have yet to find any dedicated audio editor that works in the browser. I think there is a need for this sort of specialized tool, something like the pixlr photo editor but for audio. I could even see myself using Audio Transformer in favor of pro audio programs when I just need to make a simple edit. My goal is to keep things simple by focusing on the features that interest the kids in my workshop. 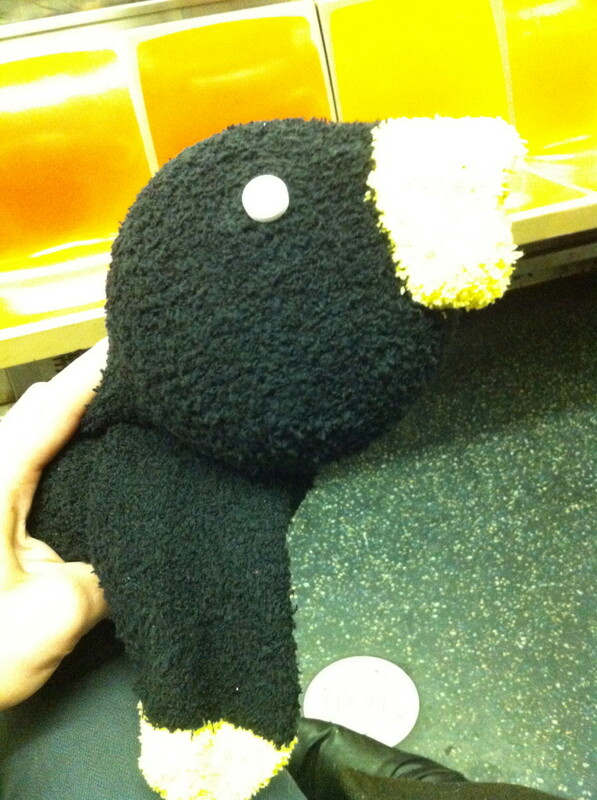 They want to hear sounds backwards, slowed down, and sped up. They need to be able to delete, crop, cut, copy, paste in order to make their edits. Fades, normalizing file volume, and determining the file’s starting point (ie. cropping out initial silence) are not so exciting for kids, and often neglected, so these should all happen automatically by default. Undo and Redo are essential. I’m going to model these functions after Scratch’s audio editor with two cursors for selecting a segment, and dropdowns to choose effects/edits. So much to play with this week! Here are my two favorite experiments. Bearpocolypse – loops through each pixel in the bear image, compares it to every other pixel, and changes each pixel based on “distance” of the RGB. In Motion Dot-tector – built off of the Learning Processing Motion Sensor, and inspired by something I saw at the Exploratorium as a kid. Ellipse size decreases if there is a lot of motion, and ellipses only show up at pixels where there is motion (a difference between current capture and the most recent capture). This one took a lot of memory to run. I got caught up in all of the examples and libraries, but wasn’t sure where to take them. I’d like to come back to Pixels to make music out of shapes and/or movement.